The Amazing Dinosaur Plant is probably the most fun plant you will ever find! The plant has been on Earth since the days of the dinosaur, as a matter of fact some Dinosaurs used to eat the plant. 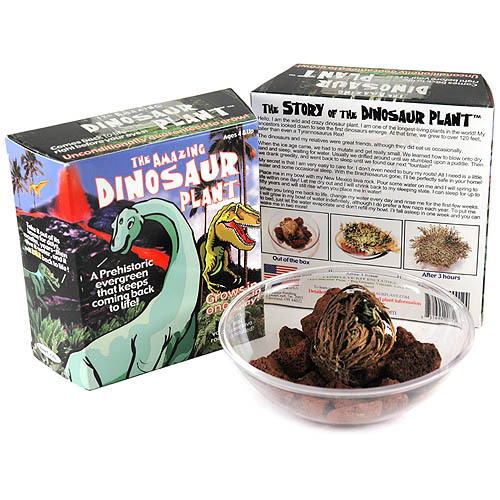 The kit comes complete with a plant bowl, real volcanic rock and the Dinosaur Plant. Simply add some water and in a couple hours the plant comes completely back to life. You can let the Dinosaur Plant dry up, and then re-hydrate the plant another day! Take it out of its home for days, months, years – then give it water, and it will roar back to life! Grows in a day!